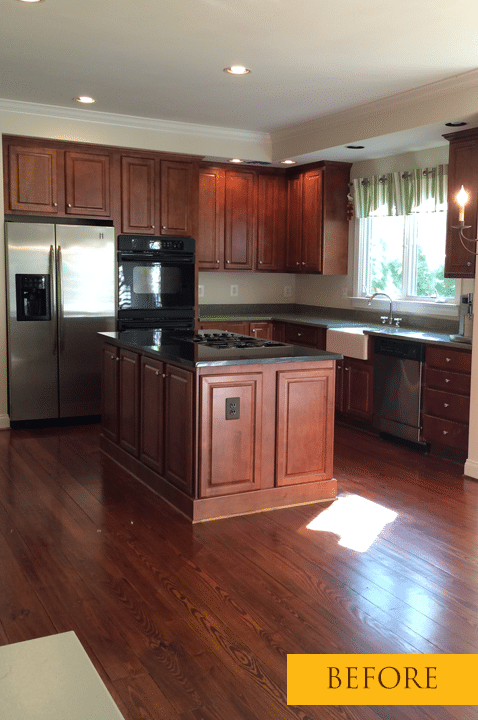 When Bryan, his wife Tracy, and their two girls moved into their new home, they set to work searching for a remodeler who could match their kitchen space to their lifestyle. Surrounded by acres of land, the homes interior was as vast and welcoming as the space around it, apart from the small dark cramped kitchen space. Bryan loves cooking and he loves entertaining. In addition, he loves spending time with his family. With a passion for sharing, he needed a space to host large groups, offer samplings from his extensive wine collection, and tend to his family’s daily needs. All of these details came into consideration with the planning of their new kitchen/dining space. In addition to the family’s kitchen needs, they wanted a future outdoor space off their second level kitchen with cascading stairs down to their large backyard patio. Let’s move the party outdoors and enjoy the beautiful scenery. It wasn’t time for adding the outdoor space yet but none-the-less it needed to be accounted for in the design. The clearest design decision was removing the wall between the dining room and kitchen, integrating them together and bringing in more lighting. It was decided French doors would be added to the designated dining area, adding a temporary railing for safety until the back deck could be added in the future. With the sweeping space now open to the rest of the home, multiple tray ceilings were integrated into each of the kitchen and dining areas, designating each zone. This design aspect broke up the long ceiling and rope lighting was added to supplement the space with a soft upward hue. Tracy was tasked with picking the counter material for their custom designed island. She chose a beautiful exotic Staturietto Marble, opting for beauty through the “imperfect” instead of a more traditional and easy-to-maintain countertop. 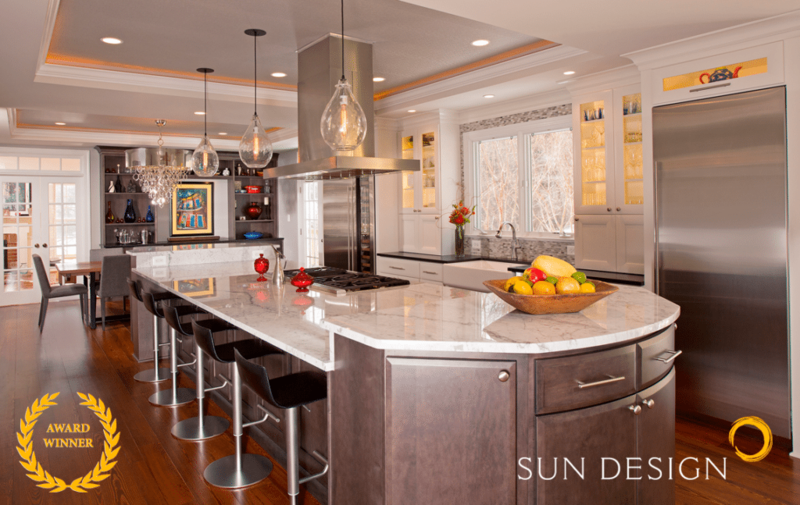 Weighing 2,500lbs, it was necessary to support the built-in island with the use of a wall truss system. 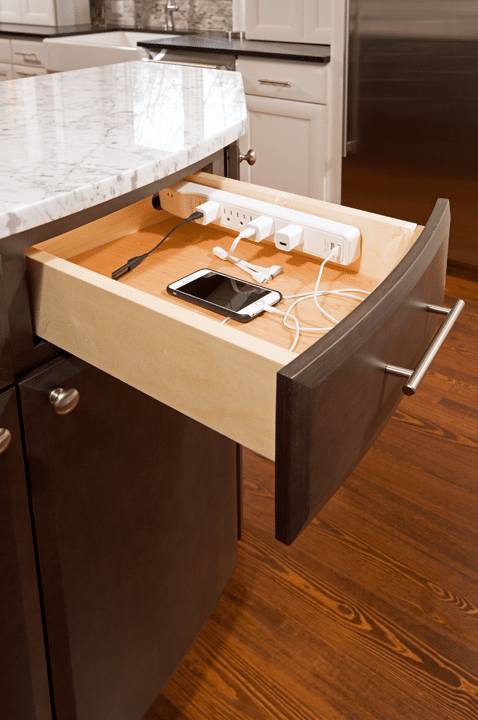 Their island is not only unique in its slate finished cabinets and marble top. Two bow front cabinets – one on each end – were designed at specific heights to encourage socializing during entertainment and cocktail hours. 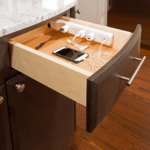 One was retrofitted with a built-in charging station within the curved drawer, serving as a hidden space where the family can easily charge their phones and tablets. Storage space was augmented throughout the island as well, reducing the number of trips Bryan would need to make to the pantries while preparing a meal. 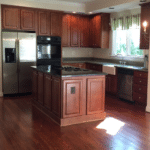 Other areas throughout the kitchen were customized for the family’s ease. Coffee lovers, a coffee bar and beverage center was added along the pantry wall with a pot-filler for their Keurig and space for their children’s Soda Stream. 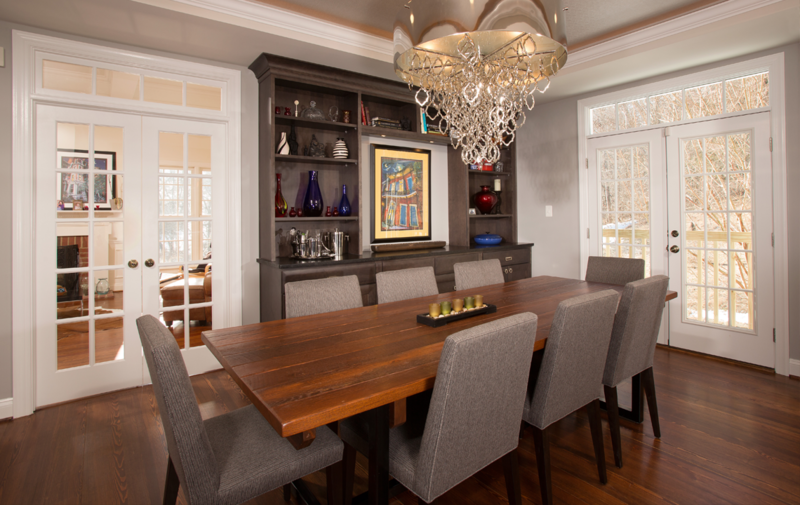 A collector of fine art, the dining room buffet was designed to feature an “Art Piece of the Month” at the center of the built-ins to easily highlight ever changing pieces. Taking full advantage of a design-build firm, Bryan and his family were able to make their kitchen uniquely theirs. It now brings in an abundance of natural lighting, has the specific appliances they needed (including a wine column for their collection) and the capacity to create culinary masterpieces while the kids and wife are close at hand. 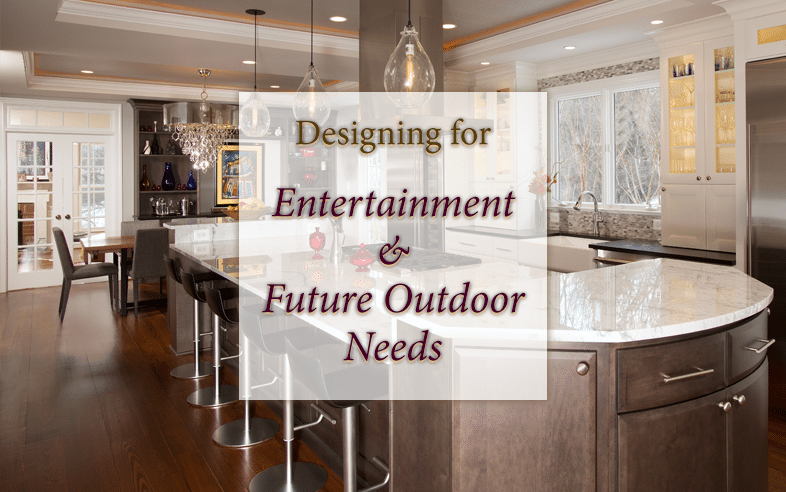 It’s everything they envisioned, and ready to unfold into a future outdoor haven.